When listing the features that really matter in a hotel we usually find: a comfortable bed, a fast/reliable internet connection, a powerful hot shower and great breakfast in the morning. To this coherent list I would like to add the bathroom amenities. It’s like the restrooms in a restaurant, you don’t choose a restaurant because of it but it will alter your opinion about the place. Either positively or negatively. In many ways, the bathroom amenities give away insights on the level of details and care you have put in the room, the attention you place in aesthetics and how much you care about hygiene. The thoughts and innovation you put in your bathroom amenities can easily make the difference between a good hotel experience and a great one. It is your chance to make an immediate impact on the perception your guests have about your brand at a relatively low cost. And vice-versa: poor amenities can break the relationship between your brand and your guests. Show me your bathroom amenities and I will tell you who you are ! This rule is ignored in too many cases. When you think about it, when dealing with an existing interior design, there is not many ways that you can create a branded experience inside your room. Bathroom amenities is one of the few so make sure you make full use of it. One shower gel. One shampoo. The soap is wrapped in a white paper withe round sticker at the top. Does the job but no magic. Yawning. This set-up will not contribute to your brand perception and can actually affect it negatively. Widely available in Europe and North America. It is a very effective solution in many ways. Easy to manage, lower operational cost and give the feeling of generosity. The only negative is that it cannot be brought home. I personally like the idea of limiting the amenities to only what matters. I usually recommend it strongly to hotels where room rates cannot justify a larger range. Widely available in four and five-star hotels. Usually includes shower gel, shampoo, soaps, shower cap, cotton buds, nail polisher, sanitary bag, comb, tooth brush kit, shaving kit etc. Effective as it does create a good level of comfort with a wide range of amenities and contributes to the hotel’s brand image. The only danger is to put too much attention in the packaging and ignore the actual quality of the product inside the box. Providing such a wide range of amenities without compromising on the quality can end-up being an expensive exercise. This is a growing trend in the luxury hotels segment. 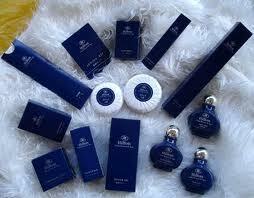 Bulgari with Shangri-La hotels, L’Occitane, Aveda or Hermes with Sofitel hotels have been pioneers. This is the latest one I found with the launch of the Thierry Mugler range. (It is so far available in two hotels: the Fiesta Americana Grand Coral Beach in Cancun Mexico and Peckforton Castle in the UK). Pros: Create a unique experience and associates your brand with a renown quality brand. 1/ Stay in brand. Make sure that your bathroom amenities set-up and selection is in line with your brand positioning and guest profile. All the values your brand is carrying must be reflected on your range of amenities. Whatever it takes. 2/Do not underestimate the importance of the investment. When attractive and well thought through, amenities will create an emotional attachment with your brand and foster loyalty. It is when guests steal them that you know you have a winning formula. 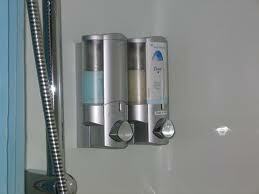 I usually recommend to have an average of 3 to 5% of the average room rate invested into bathroom amenities. 3/ Think about the relevance of the set-up before quantity. It is better to have fewer amenities that are well thought through according to your brand and guest segmentation rather than a large range with poor quality. Only provide amenities that you would be happy to use yourself. Do not provide a shaving kit if your guest is going to cut himself 9 times out of 10. 4/ Have one item in your selection that is breaking the rules and has an element of surprise. 5/ In case you decide to use a specific product brand or develop your own amenities sub-brand, make sure it carries the name of your hotel brand somewhere, be it discreetly at the back of the product. There is no point having your guests bringing back your amenities home unless it generates brand exposure. Being creative and innovative with bathroom amenities is proven to be challenging. Here is one I found that I particularly like from Chic&Basic hotels chain. Good use of space for brand positioning purpose. Any feedback, thoughts or creative ideas that are challenging the norm please let me know! Good point! 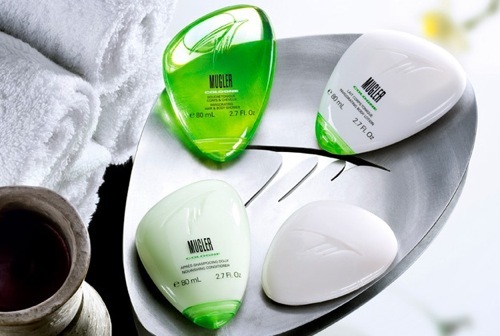 There’s nothing that brings a wannabe 5-star property down to earth like generic toiletries! 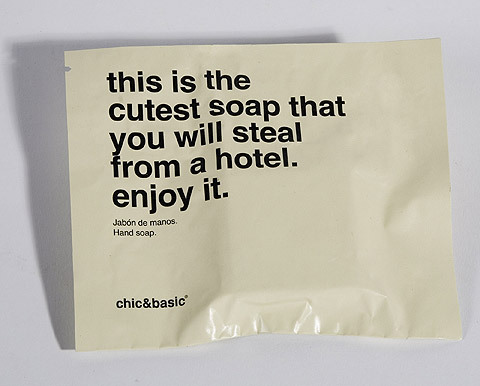 Loving the “cutest soap you will ever steal from a hotel”! The most creative lines are often the simplest ones. Un-hotel related, but on par with the intent of your topic: When I’m in anyone’s office or place of business, I’ve found the cleanliness of the office (or their desk) tells me a lot about the type of person they are. Hi Andrew, that is very true. The interior design or the set-up of an office is usually saying a lot about the culture of a company. Open space, closed doors, glass panels, meeting spaces, reception desk, general cleanliness etc. All is defining who you are as a company (or as a person) and how you will be perceived by visitors, clients or suppliers. I honestly didn’t expect that in this hotel, even though it’s a nice place I thought they would have the regular Roger & Gallet king of things but this is so much better. It upgrades the hotel to me. Thanks Sophie for sharing this picture. That’s great. There is a huge opportunity for hotels to be more creative with their bathroom amenities. In the case of Hotel Bel-Ami it would be interesting to know the cost involved as the size of the three bottles are significantly bigger than the norm and seem to be of high quality.